WASHINGTON -- Montreal Canadiens general manager Pierre Gauthier announced Tuesday that the team acquired defenseman James Wisniewski from the New York Islanders, in return for a compensatory second round pick in 2011, and a conditional fifth round pick in 2012. Wisniewski is scheduled to join the team on Wednesday in Tampa Bay. Wisniewski, 26, played in 32 of the Islanders’ 34 games thus far this season. He leads the team defensemen in scoring (18th in the NHL) with 21 points (3 goals, 18 assists) while averaging 23:14 of time on ice. He also registered 71 shots on goal, tallied three powerplay goals and amassed 18 penalty minutes. The 5’11 and 208 lbs defenseman registered a point in his last five games (1-4-5). He also recorded a point in his first seven games of the season (2 goals, 9 assists). 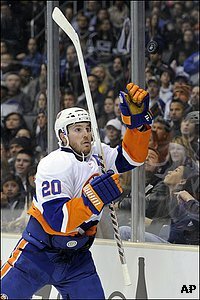 Since he first joined the NHL back in 2005-06, Wisniewski recorded a total of 118 points (20 goals, 98 assists) in 286 regular season games with the Chicago Blackhawks, the Anaheim Ducks and the New York Islanders. He also registered 468 shots on goal and scored seven powerplay goals. Wisniewski added three points (1-2-3) and 16 shots on goal in 12 playoff games with the Ducks in 2009. A native of Canton, Michigan, Wisniewski was a fifth-round selection, 156th overall by the Chicago Blackhawks at the 2002 NHL Entry Draft. Wisniewski played his junior hockey with the Plymouth Whalers in the Ontario Hockey League between 2000 and 2004. Following the 2003-04 season when he recorded 70 points in 50 regular season games (17 goals, 53 assists), he was selected to the OHL and the Canadian Hockey League First All-Star Teams, and was named the OHL and the CHL Defenseman of the Year. He also represented the United States at the World Junior Championships in 2003 and 2004.